Brilliant oversized 7' beach umbrellas with quik twist feature. Beach Table - now on sale! Rio Brands' handy Backpack Beach Chair with cooler. Lowest out-the-door-price on the internet. Guaranteed! Wonder Wheeler Deluxe Beach Cart with free wide sand wheel upgrade. 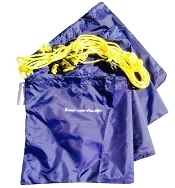 Protect your shady spot at the beach with this handy umbrella tethering kit. 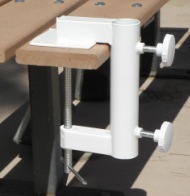 Stay cool in the bleachers with this handy umbrella holder for bleachers. Add this lightweight Beach Table to your cabana shade tent order. The chair you can wear now on sale! Backpack chair. Lowest out-the-door-price on the internet. Guaranteed! Available in 6 foot, 9 foot and 11 foot. Prices quoted are for 5400 series Sunbrella fabric. Important note: Sunbrella products are custom made for you and cannot be returned for refund.